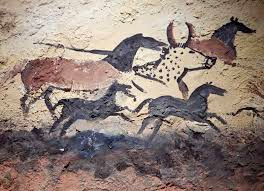 Last year I wrote an article about the cave paintings in Lasceaux France. That blog post was mostly about the pigments used. And something about the state of the Lasceaux cave which has a virus problem. [link] The Lasceaux cave system is between 10,000 and 20,000 years old. Much older cave paintings and other evidence have dated cave art in Maros, South Sulawesi, Indonesia, to 40,000 years. Until recently it was thought that the oldest cave painting known was a 40,800-year-old red disk from El Castillo, in northern Spain. So we got around in those days. The age of cave art can now be estimated through analysis of small radioactive traces of uraniam isotopes present in the crust that had accumulated on top of the paintings. Gorhams cave on Gibralter is an interesting example. Scratches on the floor, found under deposits that have been dated, look as though they were created 40,000 years ago. The Gorham cave abstractions have been attributed to Neanderthals but it is still possible that Homo Sapiens might have been around at that time. So the definite attribution of the scratches to Neanderthals is disputed. However, in two new studies, in online Science magazine, researchers lay out the case that some works of art predate the arrival of modern Homo sapiens to Europe, which means someone else must have created them. In three caves scattered across Spain, researchers found over a dozen examples of wall paintings that are more than 65,000 years old. At Cueva de los Aviones, a cave in southeastern Spain, researchers also found perforated seashell beads and pigments that are at least 115,000 years old. In light of the two lineages’ identical knack for art, the researchers even call into question whether Neanderthals were truly a distinct species, or instead an isolated European subgroup of modern humans. We know that something like 2% of our dna is Neanderthal so we must have interbred at some time. And new art research might even mean that Neanderthal man and Homo Sapiens were not actually different species after all. We might all be Neanderthals. Hmmm? And we were making abstract art. Wow!! Art history has a lot to answer for.